The sandwich is one of those things that has limitless potential. There are so many permutations of meat and/or vegetables you can marry together to get an amazing sandwich. Sandwiches are everywhere: club sandwiches for the rich at country clubs, little square bites for little old ladies to enjoy at high tea, Nutella and peanut butter slathered between two slices of thick white Gardenia bread for children and for adults like me, sandwiches from leftover ingredients in the fridge.. there is a sandwich for everyone and this is why I really love sandwiches. 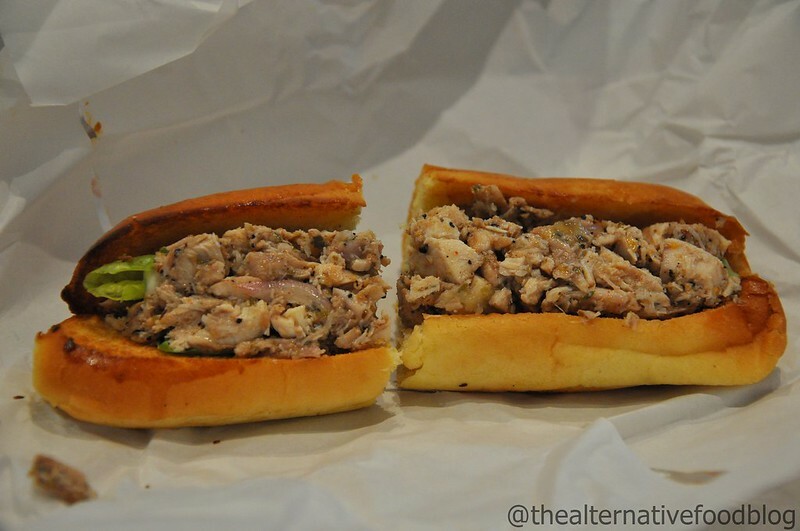 Unfortunately, our halal sandwich scene in Singapore is dismal. 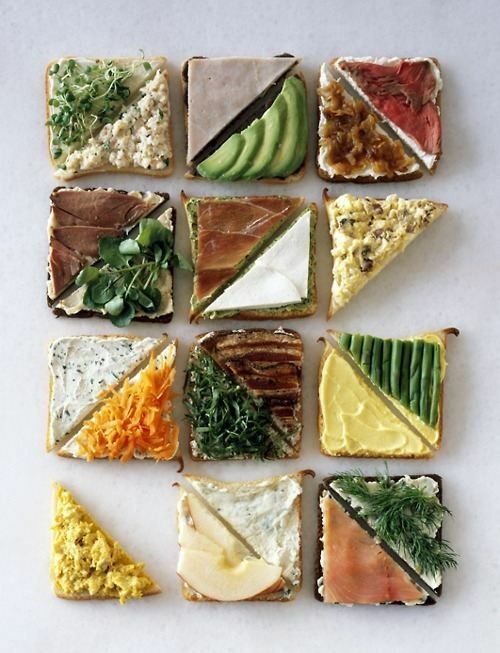 To get around this problem, I whip up my own sandwiches. I experiment with different baked meats, fresh vegetables and spreads and I’ve come to realise that a good, well prepared sandwich with the right bread, spread, body, topping and sauces can keep a person very happy. Since there is a lack of halal sandwiches in Singapore, you can imagine how excited I was when I heard about Yellow Submarines, a local store in Singapore selling halal cheesesteak sandwiches. 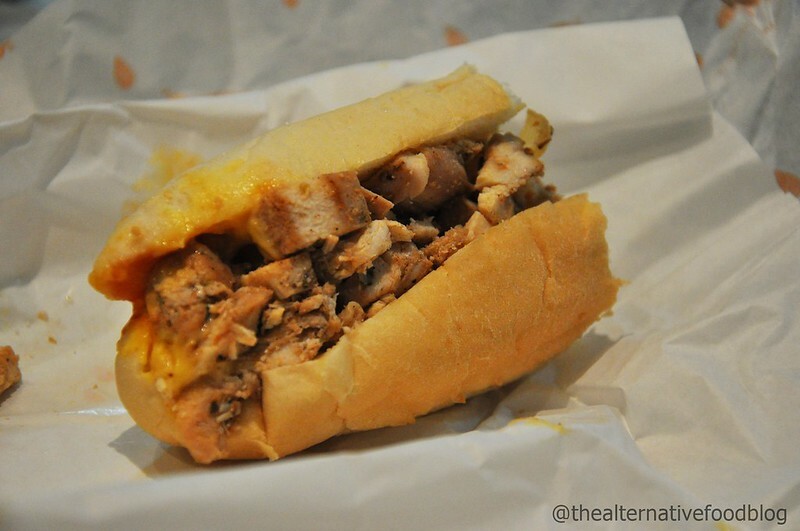 I have heard a lot about the cheesesteak sandwich, a dish synonymous with Philadelphia. In fact, everyone I know who has been to Philly swears that you must try a Philly cheesesteak sandwich before you leave. Otherwise, your trip there truly isn’t complete. 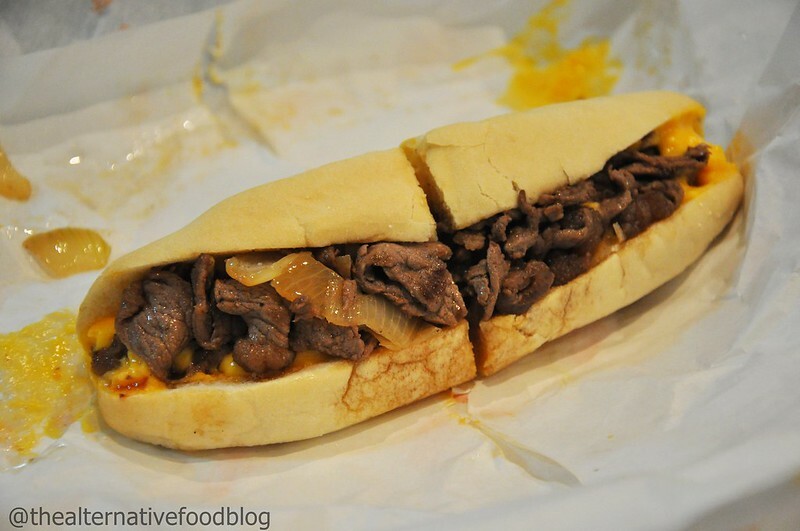 What exactly is a cheesesteak sandwich? The cheesesteak sandwich is made up of three simple ingredients: beef, onions and cheese in a small loaf of bread.Though I have never been to Philadelphia or tried a Philly cheesesteak sandwich, those who have say it’s one of the juiciest and cheesiest things they have eaten. Thus, when I heard about Yellow Submarines, I knew that a visit was in order. Yellow Submarines is located in the heart of Toa Payoh. It is a short ten minute stroll once you exit the train station. If you drive, there is actually an ERP-operated car park that is located just behind Yellow Submarines. It is very hard to miss Yellow Submarines because of its colour. The entire shop is modelled after a block of bright yellow cheese, which is, after all, what distinguishes a cheesesteak sandwich from a normal steak sandwich. Though the name might suggest some sort of link to the popular Beatles song ‘Yellow Submarine’, there is actually no link between the famous 60s English rock band and this sandwich shop. In fact, according to their website, the name Yellow Submarines came about because the sandwich loaves ,when stuffed with a generous serving of meat and cheese, resembled yellow submarines. 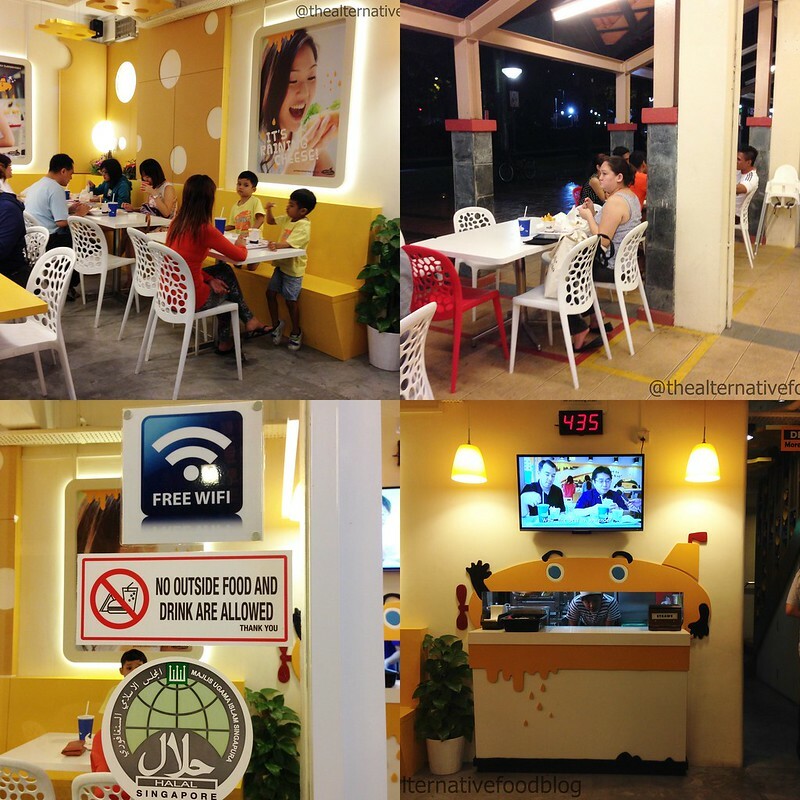 Patrons can choose to sit either indoors or outdoors at Yellow Submarines. The indoor space could seat about a total of 10 – 20 people while the outdoor space can about 4 or 5 tables worth of people. There is also a second floor to the restaurant though I am not sure if it is open all the time or if they only open it when their first floor gets too crowded. The ordering process here is akin to placing an order at a fast food restaurant. You go up to the single counter that they have and place your order. Once you have placed your order, they’ll hand you a receipt with a queue number on it and you’ll have to wait for your number to be flashed on their electronic screen before you can head to the collection point to pick up the food. Since it was raining rather heavily when I visited Yellow Submarines, I decided to take away three different types of sandwiches and enjoy them in the comfort of my own home. Truth be told, I am not a huge fan of meat and the simplicity of the sandwich did worry me a little because I figured I was in for a rather meaty experience. Thus, in order to be fair in my assessment of the sandwiches and write an unbiased review, I roped in my brothers, who are all meat lovers, to help me. Yellow Submarine Classic: My two brothers, who both ordered this sandwich, could live on a carnivorous diet and so, they had high expectations. Sadly, I don’t think their expectations were met because they were not too impressed with the sandwich, though my youngest brother was kinder in his review of the sandwich. While my first brother felt that the sandwich missed the mark for him and was just normal (standard beef, onions and cheese), my youngest brother felt that the meat was well-prepared and the cheese was a good accompaniment to the beef. He also added that the sandwich did hit him as being rather sweet, because of the addition of the onions to the sandwich. While my first brother probably wouldn’t go back for a second round, my youngest brother did say that given the lack of halal delis in Singapore, he wouldn’t mind heading back for another sandwich. 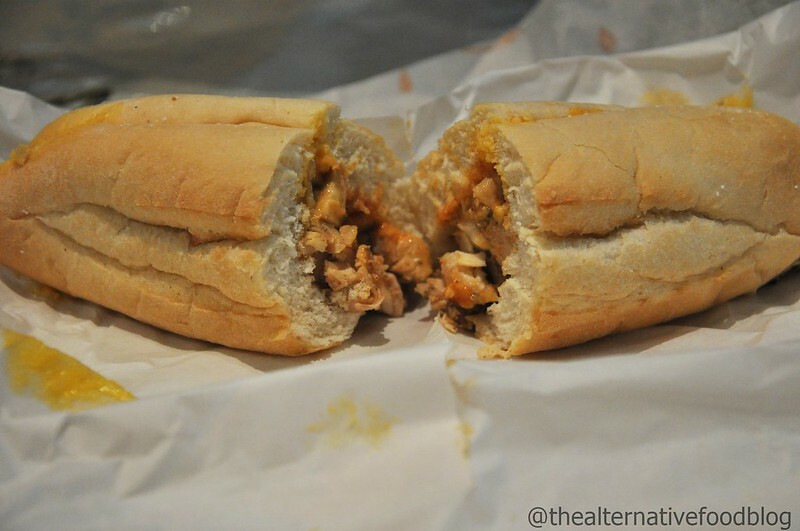 Oregano Submarine: The Oregano Submarine consists of a white sandwich loaf and baked chicken with a mango chutney spread. Before ordering, I asked the staff what was the difference between the Oregano and the Chic Submarine because they are both chicken sandwiches. I was informed that the difference lay in the mango chutney spread. The staff was also nice enough to let me know that because of the chutney spread, the sandwich is slightly colder than normal. His consideration in letting me know what to expect was really appreciated because it helped mentally prepare me for what I was going to eat. I always find such gestures that service staff make such a pleasant addition to the service I’m receiving. Similar to the beef, the ingredients are quite simple so the sandwich did taste a little bland. There was definitely lesser cheese on my chicken sandwiches (both Oregano and the Chic) in comparison to the beef cheesesteak sandwiches that my brothers got. To their credit though, the chicken wasn’t overcooked or too dry, which happens quite often with baked chicken and I did like the addition of the mango chutney because it made the sandwich a little bit more flavoursome. Chic Submarine: This sandwich is very similar to the Oregano Submarine and the only difference is the spread that is used. I think the saving grace of the entire meal was the torpedo fries. They were akin to eating thrice fried fries ala Heston Blumenthal style. The fries were crispy on the outside and fluffy on the inside. I especially loved that the fries were not too thin and were a decent size (somewhere between that of the normal French fry and wedges). And of course, the fries were lathered in copious amounts of cheese sauce, which was just heavenly. I liked the taste of the cheese sauce. It wasn’t overly sweet or creamy so I didn’t get too sick of it after a while. 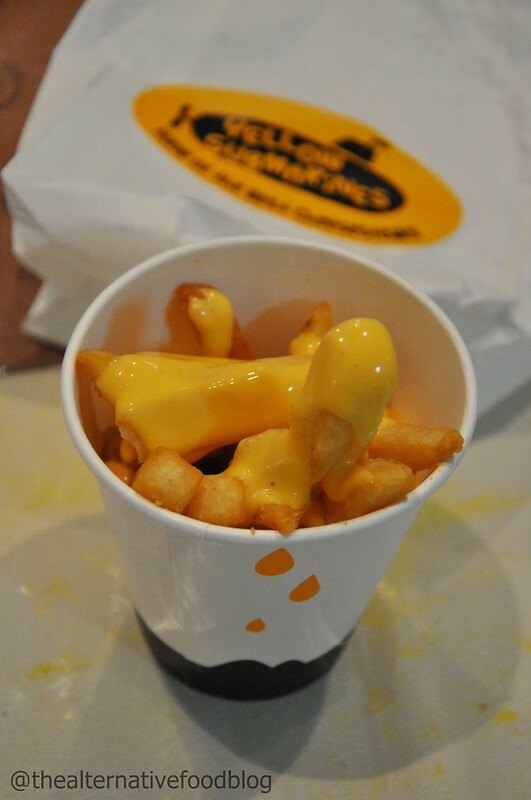 Yellow Submarines was also very considerate in their packaging of the torpedo fries for those who take it away as the sauce is packed separately so as to prevent the fries from becoming too soggy too fast. Despite the fact that the cheesesteak is primarily a beef dish, Yellow Submarines has gone out of their way to be very inclusive of people with different dietary restrictions. They have the M1 Submarine which is a vegetarian sandwich (mushrooms and capsicums) and there is also a Tuna Submarine for people who fancy seafood. I think that such considerations really go a long way in our multi-racial country. I know that I can invite my Hindu friends, vegetarian friends or even my pescetarian friends and we can all have something to eat there. Our verdict? ♡ ♡ / ♡ ♡ ♡ ♡ ♡ (2 out of 5 hearts).